The author, Shomari Black, gave me a copy of this novel in exchange for my review. 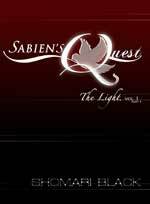 Sabien’s Quest: The Light is an interestingly written story. While listed in the YA genre it is a work doesn’t talk down to children. It assumes that they are bright and capable and able to comprehend complex principles and ideas. Black writes fantasy in a way that will delight young readers. If Black aspires to Tolkien and Lewis he is well on his way to hitting the mark. Black’s writing gives the feel of a carefully considered presentation. There are times when the story drags because of a wealth of information. There is clearly an intent to share a belief system with the reader. If you’re an author, likely you are using your writing as a vehicle to the soul and there’s nothing wrong with that, but the heavy handed presentation is not for everyone. I hear my readers saying to me “But Sabien is a monk and a monk means religion.” True, but even with a religious lead the religious theme was a bit much for this reader. Also, toward the end, Black seems to run a bit out of steam. My suspicion is that Black wasn’t sure where to leave the first story to carry on for the second novel. Once this author hits his stride the story told will be spectacular but all first novels have some degree of growing pains as it heads into a series. As mentioned, Sabien is a monk and he is on a mission to find an artifact. He is well described as a character, but overshadowed by the character that is the language of the piece. We see Sabien as the “Mob of storm clouds had grown bold” (page 50).“The ground beneath him turned to mud under the rain. He sloshed through it, his toes and ankles growing numb. In the darkness of the camp the firelight was easy to detect, and easier to follow.” (Page 330). Sabien’s somewhat mild character can’t help but fade a bit in the shadow of the strength of writing. Technically there are very few errors in Sabien’s Quest: The Light. While there are a few problems with pacing, the plot of Sabien’s Quest: The Light cannot be faulted. If you are a reader of Christian fiction who enjoys fantasy, Sabien’s Quest: The Light is a novel for you. It is listed in the young adult category, but I would suggest it for mature young adults as there are a number of complex ideas for the reader to process. Young readers might also be frightened in the moments of urgency well placed within the story. I’m really looking forward to see where Black takes this interesting character and premise. For more information about Shomari Black and his work, visit his website. You can connect with him on Goodreads, Facebook and Twitter @thugshitonly.